Ten years ago, Radio Ecoshock heard from many peak oil experts predicting oil would run out within a few years, and the price would skyrocket beyond our ability to afford it. That didn’t happen, yet, in North America for two reasons. One: consumer demand in many Western countries dropped, as vehicles and other fossil burners responded with more efficient products, and people cut back on non-essential travel. Two: hydraulic fracturing of rock, fracking, produced a small tidal wave of natural gas, which has replaced oil in some functions, like heating and electric generating plants. This all happened despite a falling price of oil, and over-production for domestic and market reasons by major oil producing countries. Now the energy demon has returned for the United Kingdom. A new study published by the Edinburgh Geological Society finds the UK’s oil and gas reserves “will run out within a decade“. The lead author is Professor Roy Thompson from the University of Edinburgh’s School of GeoSciences. Roy is now Professor Emeritus, having “published two books and 150 peer-reviewed scientific papers before retiring in 2008.” His blog energy for September 2017 is titled “The inevitable demise of UK’s offshore oil”. His recent report is “Can fracking, for gas and oil power the Scottish economy?” The study was published in The Edinburgh Geologist, from the Edinburgh Geological Society. You can read it online, as a free .pdf in your browser, using this link. When the North Sea oil and gas fields were discovered, the United Kingdom became an energy power. Not only could the island provide it’s own fossil fuels (as it had done for centuries with coal) – but the UK became an energy exporter. Now those fields are running low, production has plummeted. Thompson predicts oil and gas production by the UK will dwindle below anything meaningful within 10 years. But politicians, in both England and Scotland have a ready answer! Fracking will save the economy, and they say, help the environment too! They promise greenhouse gases will be reduced when electricity and other energy task are converted to “cleaner” burning gas. Prime Ministers in London tell the public fracking will be the next energy bonanza. They base public policy and financial planning on that success. The UK will produce lots of fracked gas, just like in America. Advocates of Scottish independence also promise that fracking will make the new Scotland boom. Thompson however has studied the geology. That doesn’t look good for the UK. There are very few places in either England or Scotland where fracking can be expected to produce results. Those oil and gas bearing rocks simply are not there, no matter what politicians say. Plus, even in the few places where fracking might produce some short-term results, it’s unlikely the more environmentally sensitive island folk would accept fracking near school yards, on public lands, and in the midst of housing. America does accept all that, apparently, because all that is happening in states like Colorado and more. We also discuss the looming problem of fracking debt, which may be itself crash the American economy. Stay tuned for that disaster when it comes. The real answer, boring as it sounds, is to use this time of dwindling fossil fuel reserves to convert to renewable energy. Scotland for example, is one of the windier places on Earth. Thompson tells us the technology of establishing deep sea wind farms has become better and cheaper in just the last year or two. That’s the real way to power Scotland. Too bad the plan by Shell to build a giant wind farm in the sea off London fell apart, but this is the future. The only question is whether the UK delays it’s move into renewables by taking the painful detour of fracking. Eventually, there is no other long-term energy future other than renewables. The rest runs out, or kills us with climate change as it runs out. Throw this into the mix. In 2007, and again from 2010 to 2014, oil was over $100 a barrel. If that happens again, as UK oil reserves run out, can the economy after Brexit and all, really afford to import all it’s energy needs? When we talk about where energy comes from, it matters who controls those oil wells, or gas supplies. Look at the uncomfortable dependence of Germany on Russian gas for winter heating and industry. Who does the UK depend on for these vital energy supplies now, and who gains more leverage if the domestic oil and gas industry falters? will that fossil fuel piper call more of the tune in a dependent UK? In the two years, Earth has experienced massive hurricanes and cyclones, not just in the Americas, but in the Asian Pacific. Could that be related to deforestation? Do forests moderate extreme weather? We’re going to explore science in development, and new ways to view the role of living things in both climate and weather. Dr. Douglas Sheil from the Norwegian University of Life Sciences is our guest. He’s a long-standing researcher and administrator in the field of forest ecology and conservation. Sheil has led projects for CIFOR, the Center for International Forestry Research, in places like East Africa and Indonesia. He is co-author of the book “Tropical Rain Forest Ecology, Diversity and Conservation” published by Oxford University Press. Douglas just got back from Borneo. You can listen to a CD Quality recording of this interview, or download it with this link. The second version is “Lo-Fi”. It is mono, lower-quality audio – but it downloads faster for people listening on their phones, or folks with low bandwidth connections. 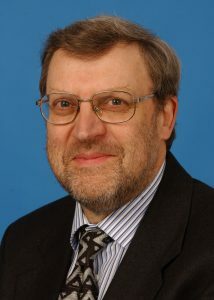 In several papers, Sheil’s colleagues include two Russian scientists, Victor Gorshkov, and Anastassia Makarieva. Both are from the Petersburg Nuclear Physics Institute. Victor is the originator of the term “biotic pump”. He and Anastassia study and publish on their theory of “biotic regulation”. Their work suggests that plants, particularly forests, play a pivotal role in (a) stabilizing the climate and (b) creating through condensation conditions which encourage both winds and rain. An explanation of the biotic pump suitable for the public can be found here. 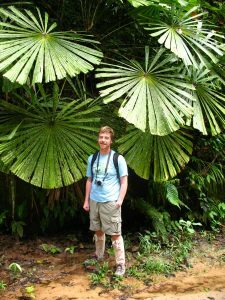 Sheil has in part adopted their work in his own career researching the operation of tropical forests, and his past administration of conservation programs. While Sheil leaves room for further proof of the theories from Gorshkov and Makarieva, he finds they explain some earth systems better than other possibilities. In any event, he awaits the science that can disprove biotic regulation. I will be interviewing Anastassia Makarieva at length about those theories in another program. The biotic regulation theory shares some heritage with Lovelock’s Gaia hypothesis of biological regulation of physical processes and the atmosphere. Lovelock at first talked about the way algae produced the oxygen necessary for more life, and continues to do so. But Gorshkov and Makarieva appear to come to bioregulation not as ecologists, but as scientists using physics and mathematics. One key for them, outlined in several papers, is the role of condensation in tropical forests. Sheil and I discuss whether and how trees can help create their own weather, including drawing rainfall from the oceans deep into forests very far inland. And when they do this, that could reduce large amounts of water vapor over the sea. This water vapor is part of the engine that powers hurricanes. The logical conclusion is that fully functioning tropical forests may reduce the formation of hurricanes. If so, the opposite may be true: when we cut down or degrade tropical forests, we may increase either the number or the power of hurricanes (I’m not sure which, and I’m not sure scientists are really sure either). In fact, Sheil says “We believe that cyclonic storms cannot maintain themselves over, or near to, extensive forests, as they draw away moisture over the land.” He’s been quoted by the Center for International Forestry Research, in a release titled “Forest loss may lead to more hurricanes, scientists warn”. When I think about it, cyclones are very rare in South America, where the great Amazon rain forest stands. I’ve only heard of one there in the last 20 years. They are also very rare in the Congo, where another great tropical forest abides. Gorshkov and Makarieva also describe forest as working like a chain of water being passed on through the atmosphere, from oceans to forests deeper inland. Douglas Sheil suggests that if that chain is broken, say by cutting down a large forest area part way inland – the inland may flip toward a great drought. Makareiva thinks that has happened in the past, affecting our listeners today. More of that in a coming show. In a week or two I’ll be talking with Anastassia Makarieva from the Petersburg Nuclear Physics Institute. She’s got some refreshing ways of looking at forests, the atmosphere, and what human civilization means for the future climate. With disasters already unfolding ahead of predictions, it’s definitely time to listen to new science to explain it. Prepare to think differently. Last week I spoke with Dr. Andy Ridgwell of UC California. He told us that erupting volcanoes caused a rapid 5 degree C warming of the Earth, and not methane clathrates. So I phoned Paul Beckwith of the Arctic Methane Emergency Group to get his response. Beckwith says methane remains a threat, no matter what cause the PETM around 56 million years ago. He points out that warming began when Earth was already so hot, there was no ice at the Poles. Methane clathrates may have already featured in the formation of that hotter Earth. Here’s another difference: vast areas of the far north were once heavy with vegetation, including forests growing around the polar sea. Scientists can still find the stumps of them preserved in the permafrost. This time around, all that vegetative matter built up over ages is beginning to come out of the deep freeze as the Arctic heats up. Small lakes and ponds are springing up across Siberia and northern Canada. Anything that thaws under them emerges not as carbon dioxide, but as the much more dangerous heating gas methane. Beckwith listed off the many signs and scientific ventures which show and document that methane levels in the Arctic are rising due to a warming climate. So the Arctic Methane Emergency Group continues. Last week’s interview with V. Ramanathan is lingering in my mind. If you haven’t heard it, please go to my blog for September 28th. You can listen to that interview right from the blog page. Ramanathan reinforced my deep worry that we humans are sleep-walking over the climate cliff. Businessmen and politicians keep talking about the future as though it’s sure to continue much like today. Everything we’ve seen in Houston, Puerto Rico, and so many other places, shows something much different. From the Post Carbon Institute, Richard Heinberg asks whether Puerto Rico without power or water is a reflection of a disturbed and declining future for us all – unless we see it as a lesson to begin the journey toward resilience, sustainable energy, and fair social relations. Our guest Douglas Sheil reported that people in Borneo are doing slightly better, even as their environment does worse. That’s the general weird truth. Bill Gates reports that human health prospects have improved, and mass famine seen in the 1960’s has not returned, despite adding billions more people to the planet. Within Western countries, we see a growing division, between those who can maintain the legendary Middle Class life, and the millions of wage slaves, homeless, sick and hopeless people. Islands and fortresses for wealth try to wall out the staggering debt and crumbling systems. We are spending the inheritance of technology harvesting the primary drivers of life on earth, the plants and animals that are stressed to extinction. It’s odd, but these can be the best of times and the worst of times, at the same time. You and I are still living at the cross-roads, in this time of turning. Our fossil powered lives have already decided some of the future for our descendants, and for all living things. The time to chose a pattern for survival is rapidly running out. This is Alex Smith. Thank you for keeping me company in these strange times, with help from our esteemed guests, calling in from all over the world. If you want to help keep this show going, find out how here.